At 70mph, I suddenly noticed that the 'Check Engine' light was on. The engine seemed to be running fine, but still being 2 hours from home, I was slightly concerned that I might have to be towed in. I'd heard that I could read fault codes through the 'dashboard diagnostics mode' on the car, so stopping at the next service station, I checked for fault codes - apparently none present. I knew that if the Check Engine light was on, there was going to be a code stored, but clearly the built-in diagnostics mode doesn't display engine fault codes. As everything seemed to be running OK, I continued home. I grabbed my laptop and connected it to the car, loaded EngineCheck and read the fault codes. Roughly translated, this is a fault with the lambda/oxygen (O2) sensor located after the catalytic converter (sensor 2). With the car running, the graphs of the voltage and fuel trim settings from both O2 sensors looked fine. And as the car has only done 30,000 miles, I knew that the sensor itself shouldn't yet have failed. Looking under the car, the sensor wiring looked OK, but I disconnected and cleaned the connector/contacts to make sure. Thinking this might have been just a one-off event, I cleared the code. This 'fix' didn't last long though - the fault appeared as a pending fault code a few days later, and then switched the light back on the following day. I checked the likely cost of the work with the local Ford dealer: about £95 (ex VAT) for the diagnostics check, plus £80-120 (ex VAT) for the sensor - and they weren't sure if I'd need both sensors replaced. My next thought was to swap this sensor with the pre-cat sensor - this way, I was hoping that I could establish whether this was a fault with the sensor or the wiring. With the car up on ramps, I removed both sensors, and the cause of the problem became clear. 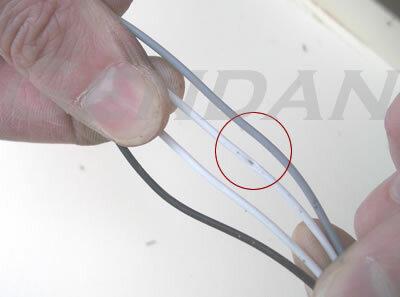 The sleeving of the wires between the connector and the sensor itself had a 2mm hole in it where it appeared to have been worn away. Sliding back the sleeving, I discovered that one of the 2 heater wires (white) had also been worn down to the bare metal. Looking at the fitting under the car, I found that the metal bracket supporting the sensor connector has a metal wiring clip on it - with very sharp edges. The movement in the exhaust (and sensor) had caused the wiring to rub against this clip over time; leading to the heater circuit being shorted to the chassis of the car - hence the fault code. A repair with insulating tape undid the damage (although a new sensor might have been a more-permanent solution), and I re-routed the sensor wire away from any sharp edges to prevent a repeat occurrence. I am pleased to say that the fault has not come back since. Total saving - over £200.